Our last few days in Bangkok were spent going to a symphony concert in the park, seeing the Grand Palace, and then saying goodbye to the Bangrak neighborhood. On the final day in Bangkok, January 27, we tried to do all the things we liked most. 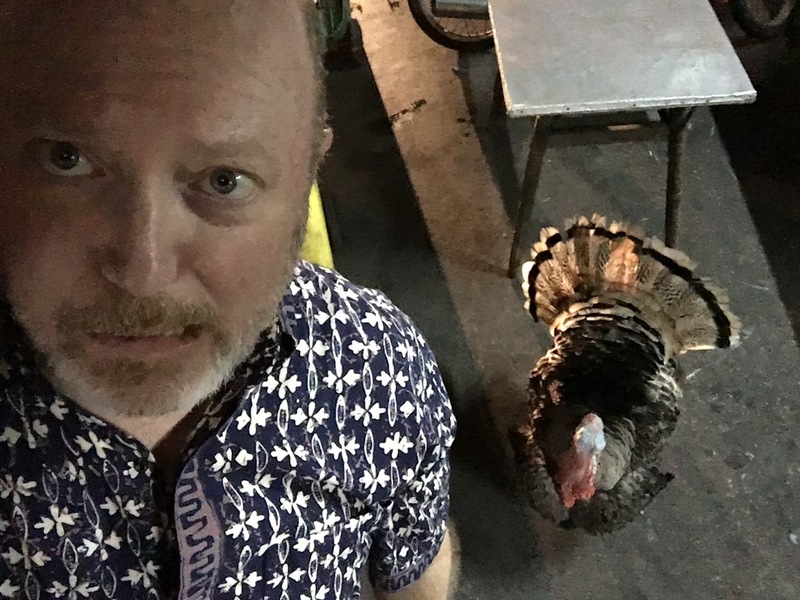 We ate street food, I had duck noodle soup, we had massages, and I saw the neighborhood turkey. The next day, we got up early and finished packing our bags. We had breakfast in the hotel, tipped all the hotel staff, and then took a taxi to the airport. We had a long day of travel ahead of us – three flights over about 25 hours. 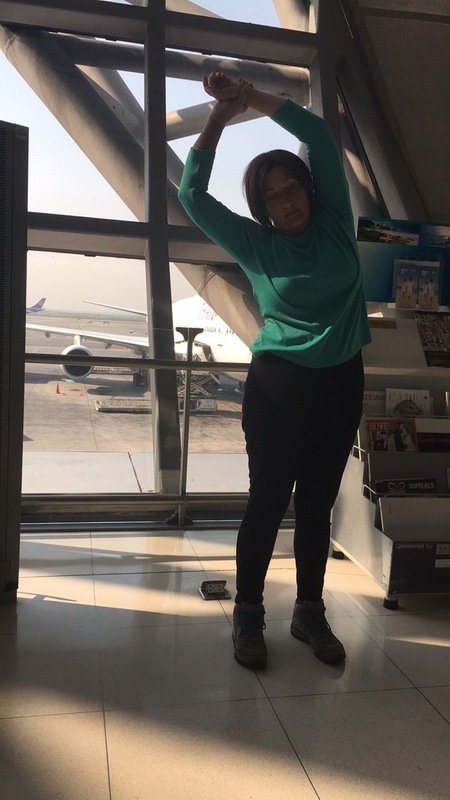 We flew from Bangkok to Beijing on a 747, but not before Beth did some stretches to limber up. 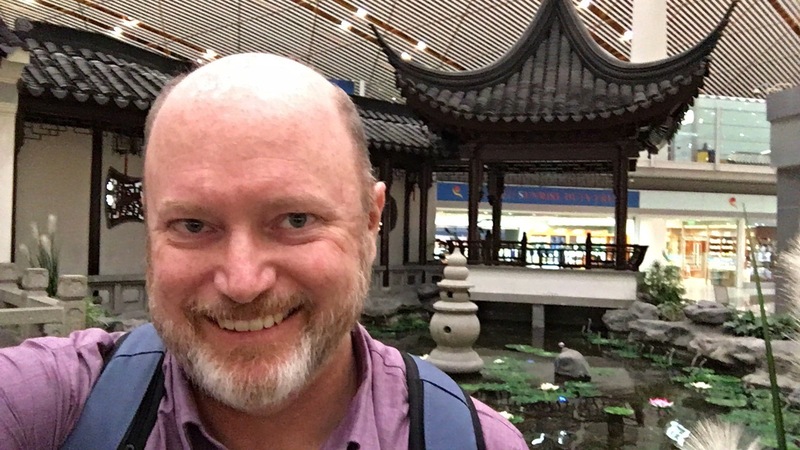 The Beijing airport was the only time I’d ever been in China, so I had to take this selfie in front of a Chinese garden they built inside our concourse. We ate a meal there, supposedly Malaysian food. The next segment was Beijing to Vancouver. That was the longest flight of the three, at about 10.5 hours. We left late and arrived late, but fortunately we were still able to make our connection. From Vancouver we had a quick flight to Denver. At long last, we were back in the city where we started from, 150 days earlier. Looking back, it was a pretty bizarre day. We left on Thursday January 28, flew for about 25 hours, saw the sun set twice, and still landed on Thursday January 28. The International Date Line is weird that way. Beth and I were both relieved and happy that all our bags arrived safely, unlike our trip from Kansas City to Delhi. Later, I found that the Chinese government had searched my suitcase, and confiscated one rechargeable camera battery. Oh well, that’s a small price to pay in the context of this huge journey. We ate some supper in the Denver airport, since we didn’t get any on the United flight from Vancouver, and didn’t have enough time in the Vancouver airport to buy anything. Then we caught an Uber to an AirBNB that Beth reserved. That bed felt so good after sitting in economy class airplane seats all day. I hate long distance flying like that, but love getting to a bed at the end.